Happy New Year! If you are feeling bogged down by extra weight after the holidays, or if you just want to jumpstart healthier eating habits for this new year, I have a special gift for you. 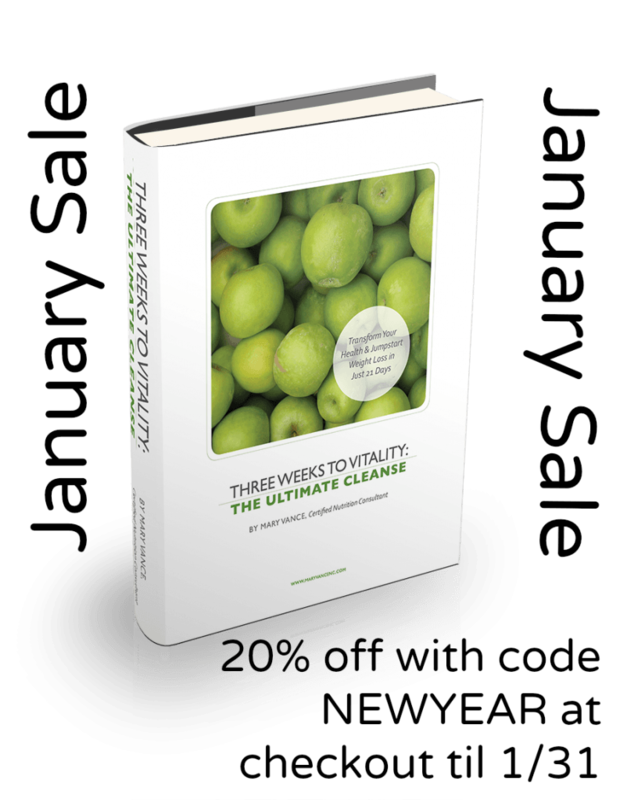 My ebook, 3 Weeks to Vitality, is on sale from January 1 until January 31 at 20 percent off the regular price. The book is a 21 day holistic detox program that will help you lose weight (if that’s your goal), cleanse and detox your body, kick sugar cravings, improve energy levels and sleep habits, get clear skin, reduce pain and inflammation, and just plain feel better. You’ll get the book AND the free bonus guide for just $19.99 all month long, just use the code NEWYEAR at checkout. I have guided hundreds of people through this very 21-day program, and it’s an easy and fun way to learn about holistic nutrition while doing something positive for your body and wellbeing. Click here to read testimonials and get full details about the book. Click here to get even more information about the book and read testimonials. If you paid me to work with you privately on a program like this, it would cost you nearly $1,000. 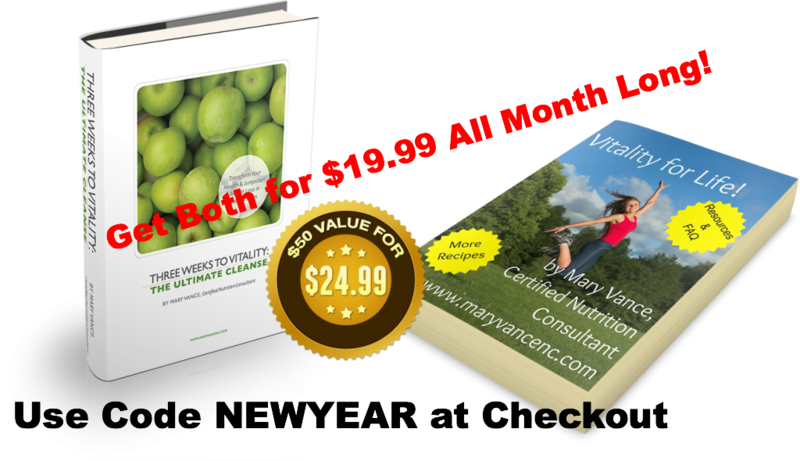 But for $19.99, you’ll get both the 3 Weeks to Vitality book AND the bonus guide: over 100 pages of guidelines, recipes, tips, resources and healthy living information. What are you waiting for? Grab a buddy and get started today! This is an ebook, so you get instant access to all the materials when you purchase and download. Can I download to my iphone or Android phone? It is not recommended that you download the files to your phone. For best results, please download to your computer or iPad.